ICS의 이더넷 실험 보드 (EEVB: Ethernet Evaluation Board) 는 합리적인 가격으로 차량용 이더넷 교육 및 실습이 가능한 다기능 제품입니다. USB 전원을 지원하는 EEVB 는 2개의 완전한 BroadR-Reach® 노드를 탑재하고 있으며 ICS사의 다기능 차량 네트워크 소프트웨어인 Vehicle Spy 와 연결을 통하여 강력한 이더넷 모니터링 장비로도 사용이 가능합니다. Vehicle Spy Trial Edition includes a version of Vehicle Spy software that supports monitoring, transmission, and scripting on Ethernet. Unlike the Trial Edition, the Professional Edition is not time limited and supports other networks, such as CAN, LIN, MOST and FlexRay. Two complete Ethernet nodes each contain their own real time scripting engine. Using the Vehicle Spy software, you can download example scripts the demonstrate Automotive Ethernet concepts. 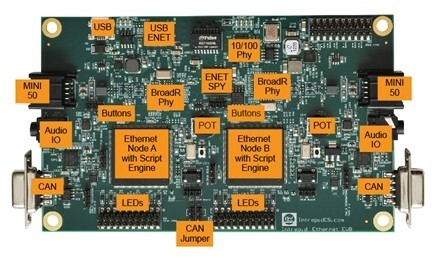 The board contains a Ethernet spy device allowing you to monitor all Ethernet communications between the nodes. Also, all the IO - including CAN, buttons, LEDs, and Ethernet - is available to scripts you create yourself with Vehicle Spy. 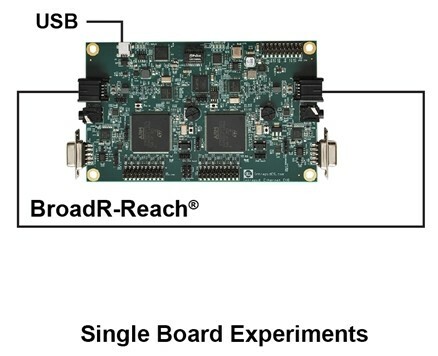 In single board experiments, the board is powered from USB and the two Ethernet nodes communicate with each other. Many experiments can be handled in this topology. 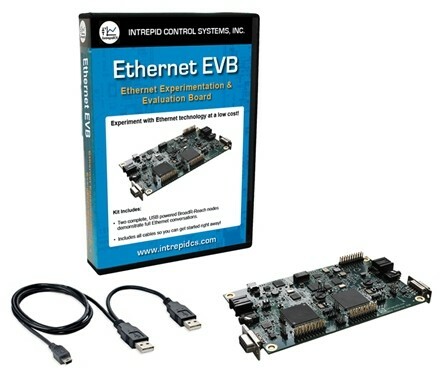 Ethernet EVBs can also serve as test nodes with an Ethernet switch. 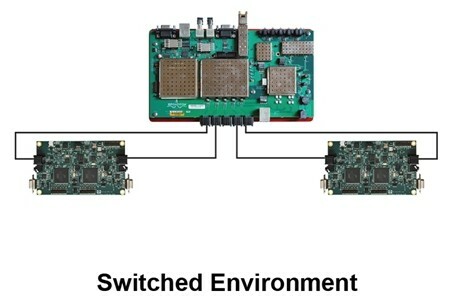 Here two Ethernet EVBs are connected to a Broadcom BroadR-Reach® switch creating a typical Automotive Ethernet network.